2018 10th annual Witch Show at Blue Moon, my home bar. I am super pround of this look. I top my last performance every year! Not to mention after posting the photos from the event I got two orders for custom dreadlock wigs! Yep, I make dreads. I got a few artsy sources of income but makeup is my favorite. 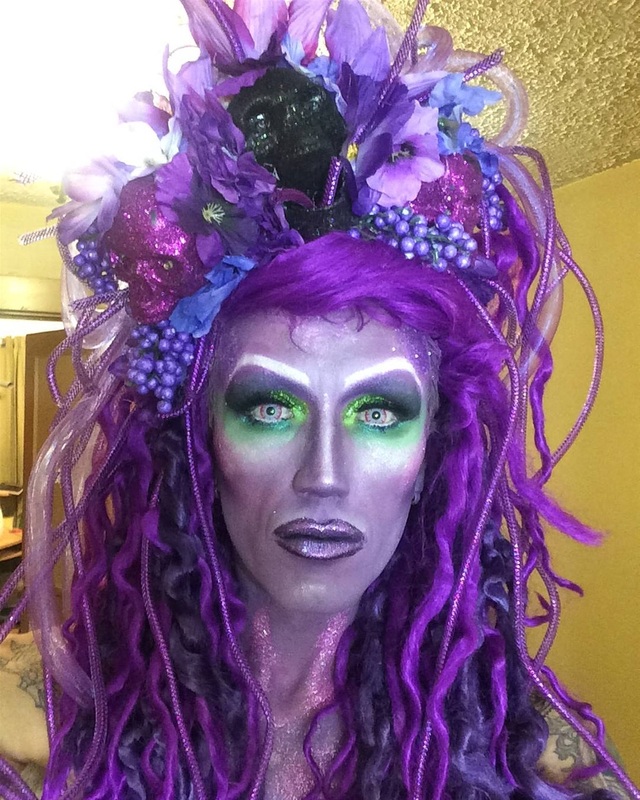 I had this purple foundation laying around for years because long time ago when I was 320lbs I meant to dress as Ursula. I never did that and since then the foundation has expired. It burned as I was putting it on but there was no backing up. I had no idea what my skin was going to look like once I took the makeup off. Ha! It all worked out great. Anyway... this is my most dramatic look that I showed you on here.... just so you know, I can do anything with makeup. October is a really really busy month for me.